He married Minnie N. Brown, Dec 24 1899, Yadkin County, North Carolina.1,5,9,12 Minnie, daughter of Henry Brown & Elisa Evans5,7,9,10,11,12, was born May 10 18815,7,9,10,11,12 [about 18801,2], Yadkin County, North Carolina5,7,9,10,11,12. Hinshaw, John, head-of-household, age 68, born Sept 1831 in North Carolina; parents born in North Carolina; married 48 years; farming; owned farm. Hinshaw, Sarah, wife, age 69, born Apr 1831 in North Carolina; parents born in North Carolina; married 48 years; 9 children, 9 living. Hinshaw, Luther M., son, age 24, born Nov 1875 in North Carolina; parents born in North Carolina; married 0 years; school teaching. Hinshaw, Minnie N., daughter-in-law, age 19, born May 1881 in North Carolina; parents born in North Carolina; married 0 years; no children. Brendle, Margret, sister, age 77, born Sept [unclear] 1822 in North Carolina; parents born in North Carolina; widow; no children. Hinshaw, John, head-of-household, age 79, born in North Carolina; parents born in North Carolina; first marriage, married 60 years; farmer, general farm; owned farm (mortgaged). Hinshaw, Sarah, wife, age 79, born in Virginia; parents born in Virginia; first marriage, married 60 years; 9 children, 9 living. Hinshaw, Luther M., son, age 34, born in North Carolina; father born in North Carolina; mother born in Virginia; first marriage, married 10 years; occupation: farmer, general farm. 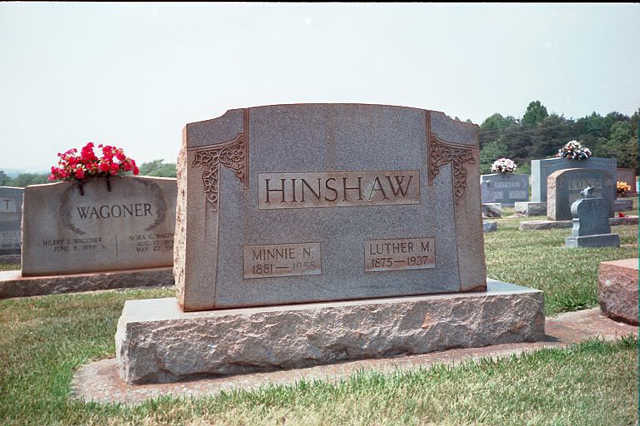 Hinshaw, Minnie N., daughter-in-law, age 30, born in North Carolina; parents born in North Carolina; first marriage, married 10 years; 6 children, 3 living. Hinshaw, Nettie B., granddaughter, age 9, born in North Carolina; parents born in North Carolina; occupation: farm laborer, home farm; attended school. Hinshaw, Leo F., grandson, age 6, born in North Carolina; parents born in North Carolina; attended school. Hinshaw, Clyde S., grandson, age 4, born in North Carolina; parents born in North Carolina. Hinshaw, Luther, head-of-household, age 44, born in North Carolina; parents born in North Carolina; owned home; occupation: farmer, general farm. Hinshaw, Minnie, wife, age 40, born in North Carolina; parents born in North Carolina. Hinshaw, Nettie, daughter, age 19, born in North Carolina; parents born in North Carolina. Hinshaw, Leo, son, age 16, born in North Carolina; parents born in North Carolina; attended school. Hinshaw, Clide, son, age 14, born in North Carolina; parents born in North Carolina; attended school. Hinshaw, Martan, son, age 8, born in North Carolina; parents born in North Carolina; attended school. Hinshaw, Abert, son, age 2 years 6 months, born in North Carolina; parents born in North Carolina. Hinshaw, Robert, son, age 2 months, born in North Carolina; parents born in North Carolina. Hinshaw, Luther M., head-of-household, age 54, born in North Carolina; parents born in North Carolina; first married at age 24; owned home; radio in home; occupation: salesman, dry goods store; not a war veteran. Hinshaw, Minnie, wife, age 48, born in North Carolina; parents born in North Carolina; first married at age 18. Hinshaw, Nettie, daughter, age 29, born in North Carolina; parents born in North Carolina; occupation: saleslady, dry goods store. Hinshaw, Leo F, son, age 26, born in North Carolina; parents born in North Carolina; occupation: salesman, hardware. Hinshaw, Martin, son, age 18, born in North Carolina; parents born in North Carolina; occupation: farmer, general farm. Hinshaw, Albert, son, age 12, born in North Carolina; parents born in North Carolina; attended school. Hinshaw, Paul, son, age 10, born in North Carolina; parents born in North Carolina; attended school. 1910 census, Booneville Township, Yadkin County, North Carolina; roll T624-1130, ED 136, page 127B, line #97, dwelling #254, family #257. 1900 census, Booneville Township, Yadkin County, North Carolina; page 5A-5B, line #50, dwelling #93, family #94. 1930 census, Edwards Township, Wilkes County, North Carolina; roll T626-1728, ED 8, page 7B, line #71, dwelling #117, family #125.